The Picture Gallery of the Kunsthistorisches Museum owes its celebrated collection of Flemish Baroque paintings mainly to Archduke Leopold Wilhelm, who as regent of the Spanish Netherlands energetically promoted the contemporary art of his day. The excursion begins at the Neue Burg, the branch of the Kunsthistorisches Museum where one can see – among the collection of ancient musical instruments – paintings by Flemish masters who worked for Leopold Wilhelm: Jan van den Hoecke, Paul de Vos, Adriaen van Utrecht and others. The painted models for a set of tapestries produced for the archduke represent a phenomenon similar to the Decius Mus cycle preserved in the Liechtenstein museum, and are equally important for the history of tapestry. Coming from this “mixed” presentation we enter the main building: the second part of the excursion takes place in the main exhibition space of the Picture Gallery on the Ring, which has housed the Imperial Gallery since 1891. On the basis of old photographs, various models of historical presentations and such paintings as Archduke Leopold Wilhelm in his Brussels Gallery by David Teniers the Younger, different ways of presenting a collection in a historical setting will be examined and discussed. The focus will be on Flemish Baroque painting: How has the arrangement of the paintings changed over the years? How did the taste of the era or of the Habsburg dynasty manifest itself? What was considered of prime importance? What challenges are faced by those in the business of running a modern museum that strives for an up-to-date image while being housed in a building that is hundreds of years old? Your guide will be Gerlinde Gruber, Curator of Flemish Baroque Painting. After being closed for more than a decade, the Kunstkammer in Vienna will open to the public again in March 2013. During this excursion curator Dr. Franz Kirchweger will give a guided tour of the completely renovated rooms of the Kunsthistorisches Museum, while Dr. Katja Schmitz-von Ledebur will focus on the tapestries in the collection. The rooms, which were renovated with the financial support of the Flemish Community, now house a display of 2,200 choice pieces. Unique in the world, the collection evolved from the treasuries and Kunst- und Wunderkammer assembled by various members of the Habsburg family in the Middle Ages, the Renaissance and the Baroque. The Kunst- und Wunderkammer were regarded as microcosms reflected in encyclopedic and universal collections of rare, curious and unusual objects. Artists were employed to turn exotic and uncommon materials into extravagant pieces of art. The collection has outstanding specimens of precious metalwork, such as the famous saliera by Benvenuto Cellini, first-rate sculpture, such as the Krumau Madonna, masterly bronze statuettes, filigree and bizarre ivory objects and virtuoso stone vessels, as well as precious clocks, complicated automatons, remarkable scientific instruments and precious games. In 1921 the collection of tapestries, which up to that time had been administered by the furniture depository, was added to the Kunstkammer. It includes almost 800 wall tapestries, most of them Flemish, which originally served to decorate the imperial palaces. Only a small number of these delicate objects can be displayed at one time, so they are replaced on a regular basis. Originating from the collections of such rulers as Ferdinand II of Tirol (1529-1595), Emperor Rudolf II (1552-1612) and Archduke Leopold Wilhelm (1614-1662), the holdings have been housed in the Kunsthistorisches Museum since 1891. In 2002 the Kunstkammer had to be closed for structural and technical renovation. The renovated and expanded spaces, as well as the redisplay and modern presentation of the objects, will provide an interesting environment for questions and discussion. >>> The Getty’s Panel Paintings Initiative promotes training of the next generation of panel paintings conservators, analysis of the panels’ structural qualities will be done and their effect on the paintings’ state of preservation discussed. The Bruegel holdings will therefore be thoroughly analyzed and examined by means of the most technologically advanced, non-invasive research methods, in order to bring the documentation on the paintings up to date. The findings yielded by the technical examination of the panel paintings will be evaluated in the light of art-historical issues concerning these major works of sixteenth-century art by Pieter Bruegel the Elder. The provenance of the panel paintings will also be traced as completely as possible, from time of their origin until they entered the Imperial Collection and up to the present day. The museum’s project team is led by Elke Oberthaler (director of the conservation studio of the Kunsthistorisches Museum) and Sabine Pénot (curator of Netherlandish and Dutch painting at the Kunsthistorisches Museum). During this excursion members of the project team Björn Blauensteiner, Ingrid Hopfner, Georg Prast and Sara Mateu will present the first results of the research carried out on Christ Carrying the Cross. The Albertina owns one of the most important collections worldwide of Netherlandish drawings from the period 1450-1650. 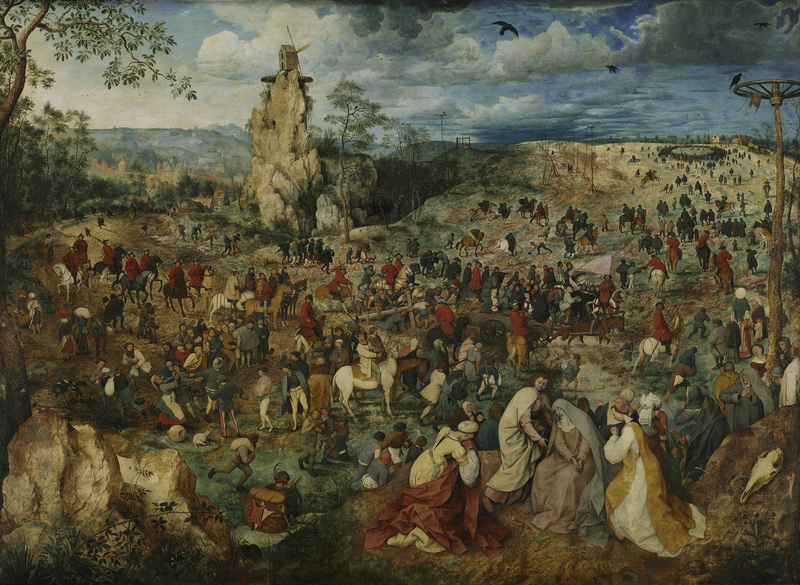 The epoch of “early Netherlandish art” is represented by some outstanding works by artists from the circle of Jan van Eyck and by Petrus Christus and Dirk Bouts, and also includes works by Hieronymus Bosch and Pieter Bruegel the Elder that mark the first high point of this select collection. The later sixteenth century is present in the form of master drawings by Gossaert, Heemskerck and Goltzius. The core area of the collection consists, however, of works from the Dutch Golden Age, the seventeenth century, and the Albertina’s holdings in this area boast drawings by Rembrandt and his school. The Southern Netherlands, ruled by the House of Habsburg, is represented by the most renowned Flemish masters of their day: Peter Paul Rubens, Anthony van Dyck and Jacob Jordaens. The exhibition, which is accompanied by a comprehensive catalogue, will show how the broad thematic spectrum of Netherlandish art of the seventeenth century – landscape, seascapes, topographical views, portraits, rustic genre scenes, still lifes – is rooted in the achievements of previous centuries. For over two hundred years, the practice of harking back to this important Netherlandish tradition inspired artists to ever greater accomplishments. After viewing the exhibition, you will have an opportunity to visit the Albertina’s study hall with the curators Dr. Marian Bisanz, Dr. Christof Metzger and Dr. Eva Michel, who have selected groups of works intended to provide deeper insight into our collection and its core areas and to initiate a discussion of various aspects of Netherlandish drawing. If you would like to see a specific drawing or print, please send your request to CODART before 1 April 2013. The Paintings Gallery of the Academy of Fine Arts Vienna – the heart of which is an aristocratic collection – is known for its outstanding holdings of seventeenth-century Dutch and Flemish painting. After its establishment through Count Lamberg’s donation of his collection of paintings to the Academy in 1822, the Paintings Gallery grew to include almost 1,600 works. Since CODART’s last visit in 2007, the exhibition spaces have undergone extensive renovation and were re-opened in September 2010 after a building project that lasted two years. The refurbishment of the museum within the structure of its sensitively revitalized Hansa architecture called for the reorganization of the permanent and now downsized display, which leaves room for small, changing Im Focus exhibitions. In addition to inspecting the newly renovated rooms, the visit in the Paintings Gallery will focus on the most famous work in the group of early Netherlandish painting: The Last Judgement triptych by Hieronymus Bosch. It is the absolute highlight of the collection. Two research projects are devoted to the group of early Netherlandish painting. One project, lead by Claudia Koch, is covering the groups of early Netherlandish and early German panel painting in the collection. The second project, lead by Renate Trnek, is focusing on the The Last Judgement triptych by Hieronymus Bosch from a monographic point of view. The Bosch project is covering all fields, from natural-scientific research to the critical evaluation of the Viennese Triptych and the art historical questions arising from new orientations and results in the recent Bosch-research. >>> The excursion will continue in the Graphic Collection where Netherlandish drawing of the sixteenth and seventeenth centuries is represented by around 260 sheets. A number of highlights, such as the works by Rembrandt and some of his pupils, were presented several times in exhibitions held in the Graphic Collection. The last time this happened was in 1997, to mark the opening of the new Graphic Collection in the Akademiehof, at which time the exhibition included a selection of German and Italian master drawings of the same epoch. Nevertheless, many interesting sheets and even whole groups of sheets whose attribution is problematic remain unpublished to this day. Erwin Pokorny, the author of the 1997 exhibition catalogue, will present these little-known sheets in the original, in addition to a few prominent problem cases, such as The Ship of Fools in Flames, a drawing from the workshop of Hieronymus Bosch. The Graphic Collection hopes to host curious visitors who will engage in a fruitful discussion. The Princely Collections of Liechtenstein contain major works of European art spanning five centuries and are among the most important private collections in the world. Dating back to the seventeenth century, they are rooted in the Baroque ideal of princely patronage of the arts. For generations, the House of Liechtenstein has consistently nurtured this ideal, systematically adding to the collection’s holdings in keeping with an active acquisitions policy which continues to this day. Today the Princely Collections contain some 1,700 paintings with masterpieces from the early Renaissance to the Austrian Romantic era, including works by Lucas Cranach the Elder, Raphael, Peter Paul Rubens, Anthony van Dyck, Frans Hals, Rembrandt, Rudolf von Alt, Ferdinand Georg Waldmüller and Friedrich von Amerling. Of equal art-historical importance is the collection of Italian bronzes, the focus of which lies in masterpieces of the sixteenth and seventeenth centuries. In addition to these outstanding paintings and sculptures, the Princely Collections also contain important holdings of prints and engravings, pietra dura objects, enamelwork, ivories, decorative arms, porcelain, tapestries and furniture, all of which once graced the castles and palaces owned by the family. The excursion will focus on the Decius Mus Cycle which is one of the most frequently discussed body of works by the master Rubens and is on display in its entirety in the Gallery. Having entered the collection as the work of Van Dyck, their true author was soon recognized as Peter Paul Rubens. The Rubenianum’s volume on this cycle, currently in preparation, may well offer additional findings. The results presented here of the recent technical examinations by Dr. Reinhold Baumstark are of the greatest scientific interest. A tour of the Picture Gallery in the garden palace in the Rossau will provide an opportunity to view other important paintings by Flemish masters, some of which have never before been on public display. The complete graphic works of Peter Paul Rubens in the Princely Collections will be on view in the library of the garden palace. Works from the repositories of the Princely Collections will be presented in the galleries to round up the tour.